Builders working on a flatblock in East Hunsbury have been forced to leave after an intruder gained access and started throwing objects. 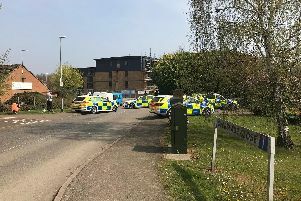 The man climbed onto the scaffolding of Overslade House - in Overslade Close near East Hunsbury Library - this afternoon. He began throwing objects from the roof, gesticulating and making demands. He began on the roof but has since come down to a lower level of the scaffolding. Police were called and five vehicles - including a police dog team - and an ambulance are waiting at the scene. Overslade Close is closed to traffic until the standoff is resolved. Overslade House is owned by Northampton Borough Council and is in the midst of a large extension to add a fourth floor and create 40 family apartments.